Ready for a cool campaign from Rite Aid and Revlon in honor of National Breast Cancer Awareness Month? Rite Aid is partnering with Revlon and encouraging customers to Think Pink during National Breast Cancer Awareness Month in October. During a month-long “Beauty of Giving” campaign, fans of Rite Aid’s Facebook page can honor someone affected by cancer by sharing their story and entering for a chance to name a new pink shade of Revlon nail polish in their honor. The “Your Story, Your Shade” contest will culminate with the two most compelling stories being featured on Rite Aid’s Facebook page, with a vote in December to name the new shade based on the most compelling story. First-place winner will receive an all-expenses-paid trip to New York City to attend the Revlon Run/Walk in May. Also part of the “Beauty of Giving” campaign, Revlon is donating $1 from each Rite Aid sale of all specially marked high velocity shades of pink nail and lip products. All donations, up to a maximum of $25,000, will go toward supporting women’s cancer research. BB Couture Has Me Seeing Green! 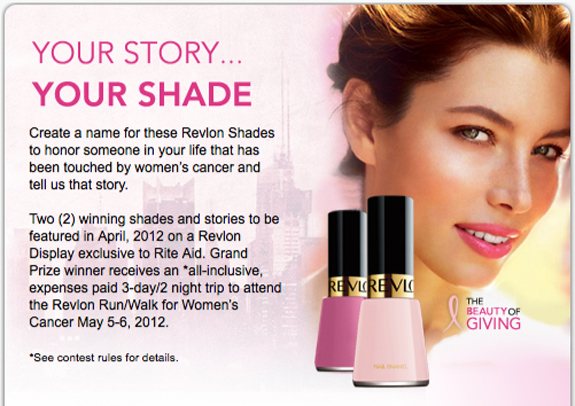 Very cool of revlon to do that. Good to know they are doing this, I rly appreciate all companies that do this kind of things. This is a great idea for a good cause. It’s always nice to see these kind of contests.